Anyhoo, so there I was attempting to down my first huge glass of water for the day, freshly-brewed coffee cooling to a drinkable temperature rather than molten-lava-hot, and I saw this meme. I like this meme, and shared it, because I don’t think enough people in the world get the meaning behind the words. Love without attachment. Of course, I write that, or have said it in the past, and people look at me like I have suddenly transformed into Medusa before their very eyes. I’ve had people tell me that “a little bit of jealousy is good for a relationship”, with every ounce of their body believing that’s true. They don’t realize that when they say that kind of narrow-minded, and in my honest opinion – borderline psycho, tenet that my eyes glaze over and instantly I pity them. I’ve attempted to argue, “How is it love if you’re jealous?”, explaining that to me that bespeaks not of love, but ownership. But, they rarely get that jealousy, therefore attachment, doesn’t equal love, and then they try to accuse me of not loving Mr. Muse. Oh how far from the truth they could be – just ask Mr. Muse if the opportunity presents itself. So, here it is… my philosophy on love, and therefore attachment. Attachment is pointless. While the quote says it comes from a place of self-love, I believe it also comes from fear and lack of belief that one is “good enough”. I’m confident that I’m “good enough”. I have no fear that Mr. Muse will run off and find someone newer and more exciting and leave me by the wayside; and even if that were to happen, that is the path he would be choosing for his life. Mine would continue on, it would be altered obviously, but it continue. As I grew up, I saw relationship after relationship among my peers crumble into steaming piles of…. oh, let’s say imploded, derelict buildings, all because people couldn’t get it out of their heads to love the other person without attachment. They clung. They checked-up on who their target was talking to and thank goodness I grew up before the prevalence of cell phones. Heck – I was even threatened for talking to a boy in high school who sat next to me in Band Class and at sporting events by his one-time girl friend. Said boy wasn’t present for my dressing down (in the gymnasium… during a basketball game), but when he got back, I chuckled and said, “So, apparently I’m not supposed to talk to you… at least that’s what your girlfriend says, because I laugh too much when we talk.” He shook his head sadly and said that he’d been trying to get around to breaking up with her because she was so jealous but he just hadn’t gotten to it yet. They were finished within a few days. No, he and I didn’t start dating after that but that began my reputation as a “Jezebel”, at least as much as I can pinpoint it. Didn’t see that one coming, huh? So what does it all mean? Well, when Mr. Muse first mistakenly joked around about how I was “his” – he never saw my reaction coming. I bursted out, “No. I’m MINE. I love you and choose to be with you because I like who you are. I am not yours.” Yes, I’m independent (like that wasn’t obvious), but I know that the moment a relationship took on the stench of possession, attachment and jealousy – it was doomed. That is something I will not sit quietly on the sidelines and watch happen. 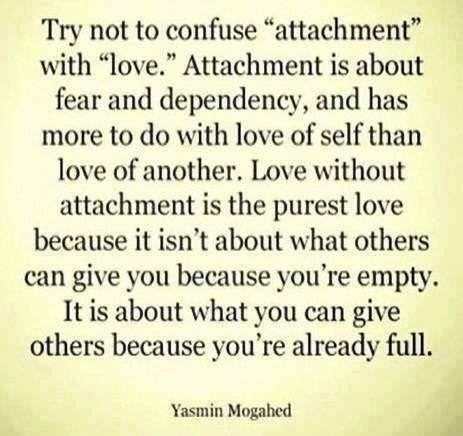 So, what are your thoughts on Love and Attachment? Do you agree with my philosophy or feel strongly about another viewpoint? How did seeing relationships of others form your views? Do you feel it’s better to be needed or wanted? This entry was posted in Personal and tagged attachment jealousy love, if you love something, independence, Love, quotes Yasmin Mogahed, The Big Lebowski, The Dude, The Purpose Fairy. Bookmark the permalink. Wonderful topic! I happen to agree with your ideas. My litmus test is this: If I wonder how my partners growth/success/failure/challenges/etc.are going to effect me, I am not in this relationship for the right reasons. Kat and I got mirrored tattoos, on me my sign is first, intertwined with hers around a yin-yan. Her tattoo is the exact same except her sign comes first. Dig it? I view my Dad’s relationship with my step mother as how I want my relationship to be and there are, at the risk of being judgemental, plenty of relationships I can see that I don’t want to be like. Needed or wanted? Neither, but a spice that adds to an already awesome stew is pretty cool. I have to agree with you on the litmus test, though I can’t say that I’ve actually considered it until now. I’ve always been Mr. Muse’s best and loudest cheerleader, and he’s always been my quietest, most supportive one (he’s a really quiet guy). I LOVE the fact that he has hobbies that I have no interest in because it makes him interesting AND – he gets excited about them. I have things he’s not interested in at all, too, but he listens to me when I babble on about them. We agreed early on, before we were married, that we were a team; that we were a “business of us”, a CEO and a CFO that has flipped and flopped through the years, but we are always talking to each other about what is going on in our lives. Not to mention that he calms me down when I need it and I fire him up when he needs it. I think we’re a darned good match. I believe jealousy has way of seeping in and poisoning relationships. If it does seep in than usually it reveals other challenges to the relationship such as issues of trust. I have to ask then, does jealousy seep in because it’s allowed to or because it’s expected? “Things that make you go ‘hmmm'”.